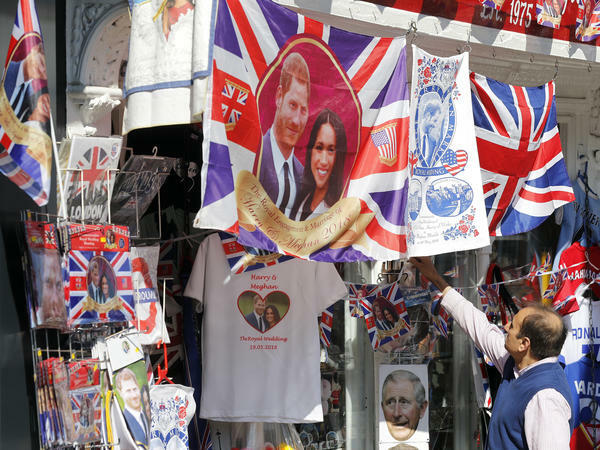 A souvenir shop in Windsor, England, sells wedding-themed T-shirts and other memorabilia ahead of Saturday's royal wedding. Mike Drummond of the Red Bus souvenir shop. 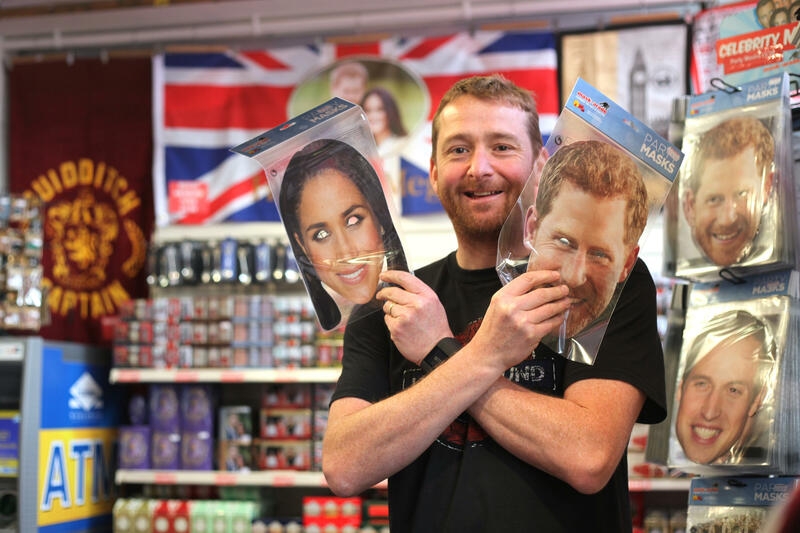 Most customers now, he says, are foreign tourists "showing a lot of interest" in Saturday's much-anticipated wedding in Windsor, England, of Prince Harry to Meghan Markle. 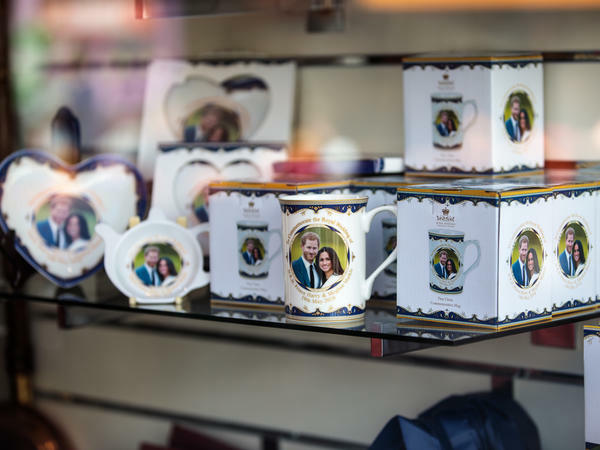 Royal wedding memorabilia sits on display in a shop window in Windsor, England. A supermarket in Windsor, England, sells Marmite bearing the names of Harry and Meghan. Marmite is a traditional English spread. A woman passes a shop window decorated with royal wedding memorabilia in Windsor, England. Most customers now, he says, are foreign tourists "showing a lot of interest" in Saturday's much-anticipated wedding in Windsor, England, of Prince Harry to Meghan Markle. And in preparation for the traditional street parties with which the British celebrate royal occasions, Brits are buying items including Harry and Meghan bunting — strings of triangular flags — and Harry and Meghan masks. "People like them," Drummond says of the royal couple. "They're a bit cool, aren't they?" U.K. businesses are working hard to benefit. Malls are setting up giant screens and deck chairs so people can watch while they shop. Restaurants, bars and golf clubs are offering wedding-themed experiences with cocktails with names like "Ginger Groom" (rum and ginger ale, basically), and British and American fusion menus — featuring, for instance, cornbread and fried chicken alongside sticky toffee pudding — to celebrate the British groom and U.S. bride. One restaurant in Windsor claims to have sourced what "is believed to be Ms. Markle's favorite cheese" (Grey Owl Goat's Cheese, since you ask). The Queen of Hoxton pub in London is hosting a riotous-sounding party, offering free shots for people who show up in a wedding dress. A consultancy, Brand Finance, which last year released a report asserting that the monarchy is good for the U.K.'s economy, predicts a $1.3 billion boost from the nuptials, to include an increase in tourism revenue of more than $400 million and a $67 million boost from sales of souvenirs like the Red Bus shop's mugs and magnets. 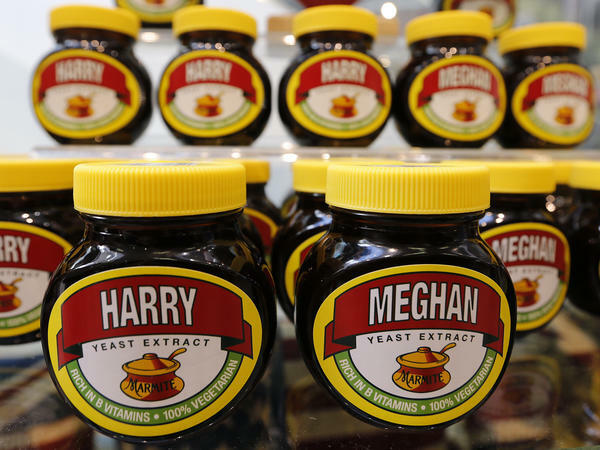 But at a time when Britain's leaders are struggling to plot a post-Brexit global role for the U.K., and when British identity can feel confused and adrift, some skeptics are calling into question the benefits to Brits of expensive royal weddings. A YouGov poll this week found that most respondents aren't particularly interested in the wedding. Graham Smith, who runs the anti-royalist campaign Republic, which commissioned the poll, cites the cost of security for the wedding as a significant expense likely to be picked up by taxpayers. There are no formal estimates of how much this will cost, but a freedom of information request by the U.K.'s Press Association found that Prince Harry's older brother William's wedding in 2011 incurred a $8.5 million policing cost, about half of which was paid by the central government. The YouGov poll found that 57 percent believed the royal family should pay for wedding security. The costs of the wedding itself — which luxury wedding planners have estimated at about $2.7 million — will be paid by the royal family, whose income comes from a variety of sources. The Queen is paid a Sovereign Grant from the government, this year expected to be about $108 million, which is a percentage of the total income from the assets she owns, known as the Crown Estate. Other members of the royal family receive income from large amounts of inherited land and investments. These properties, existing in a gray area between public and private property, are exempt from some forms of tax — a system which has been criticized over the years, such as when the queen's mother died and left her an estate of more than $67 million, on which she did not pay inheritance tax. In recent years, the queen and other members of her family voluntarily began to pay income tax. Britain's tourism board, VisitBritain, says that the royal family is important to the country's tourism industry. The board says about $6 billion is spent annually by people attracted to the U.K. because of its culture and heritage, and the royal family is part of that, both through the palaces and castles that dot the country and the "legends and stories" associated with royalty. The royals are "part of the warp and weft, I think, of the British nation," says Mike Robinson, a professor of tourism at the University of Birmingham. Robinson adds that it is very difficult to establish exactly how many people visit the United Kingdom because of the royal family. But says the British monarchy is better known than the world's other two dozen or so royal families because it traces its ancestry back to Anglo-Saxon times and became famous globally during the time of the British Empire, and subsequently with the union of post-empire states known as the Commonwealth. "The concept of the British nation is a more complicated and complex one than ever now. But nevertheless, the physical heritage and the legacy of the royal family — it's there for everybody to see," he says. Royal palaces and castles are among the U.K.'s most-visited attractions, he notes. 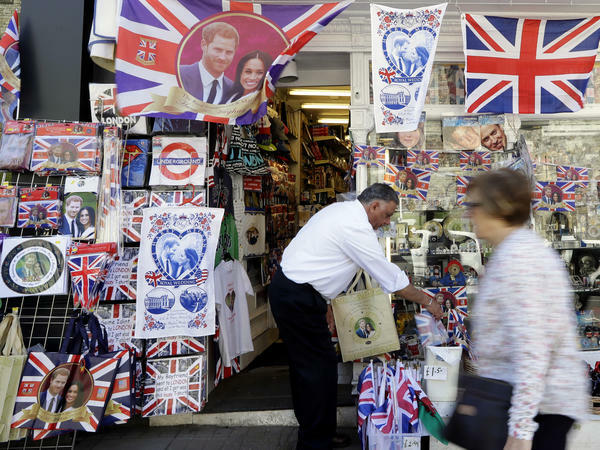 For Mike Drummond, working in the London souvenir shop, there is no question about the value of the monarchy. "For our business, they're absolutely essential," he says. "People might laugh at the royals or complain about them, but people that visit Britain, especially Americans, they come for the history. And the royals are part of that history."